While I (im)patiently wait for the yarn I ordered for the crocheted potholder swap to get here, I feel the need to finish off a few projects that have been languishing on the needles for a bit now so that once it gets here, it will be a crochet-partay 24/7. (Whew! That said….) 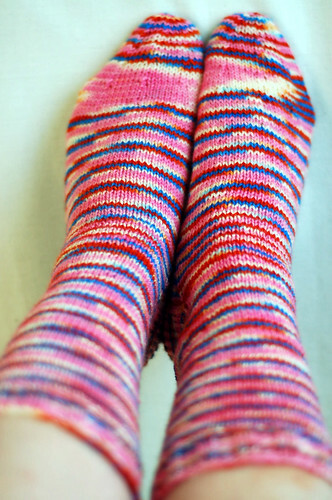 These totally basic socks were a joy to knit in this super-sweet colorway. It was just the jolt of color that I’ve needed for a while now! I think I have fallen deeply in love with Madeline Tosh yarns. The base is so squishy and fabulous, and the colors are so very pretty – my favorite qualities in a yarn. I think these might be my favorite pair of socks right now. I could have made them a little bit longer in the cuff, though. I wasn’t quite sure how much I could get out of the yardage, but I had quite a bit of yarn leftover. 395 yards is more than enough for 9 inch cuffs. I’m used to working with Koigu, which means less yarn and shorter cuffs, but this is good to know for the future. Especially since I may have acquired a few more skeins of MadTosh Sock. Yeah, told ya I was smitten. I went into a frenzy at The Purl Diva and The Backwards Loop. It’s as dense as the Koigu, comes in a gorgeous array of colors, and is less expensive. I’m in lurve – big time. By the way, I think I have coined a more fanciful term for a Round Toe. From now on, I am calling it the “Kitchener-Free Kitteh Sphincter.” Catchy, no? Hehe, great name for the round toe! I think you’ve hit the nail on the head with that toe name! I am laughing so hard right now!Also, glad to hear good things about the MadTosh sock yarn. I just bought my first skein! Yes, you have named it well, my friend. And I am loving your socks, they are so cheery!! Real nice blog and I love the socks!